Finally Friday. It couldn’t come soon enough, this week has been insane. I can’t wait to finally get some sleep! I’m going out to a (post) Halloween party tonight, so my post today will be brief. But hopefully, what it lacks in length it will make for in creativity! So let’s get started! 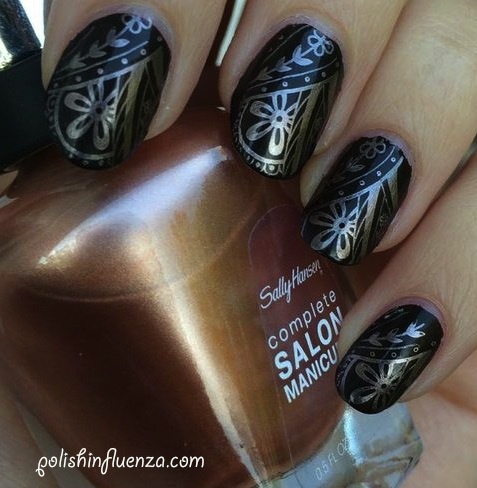 Remember when I reviewed the Sally Hansen Complete Salon Manicure fall 2013 trios a little while back? I commented that I couldn’t wait to stamp with Gold Roses, that delicious coppery shade I swooned over. Well, that time to stamp is now. I started by painting my nails with Rue Beauté 063, a lovely dark brown that screams hot chocolate and warmth. It’s amazing on its own, but it was just begging for more. 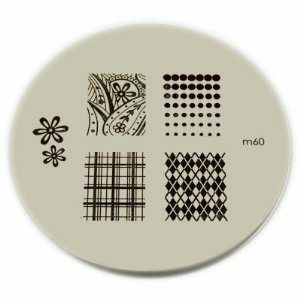 So I took Konad Stamping plate M-60 and used the paisley design (shown below) to create the design. 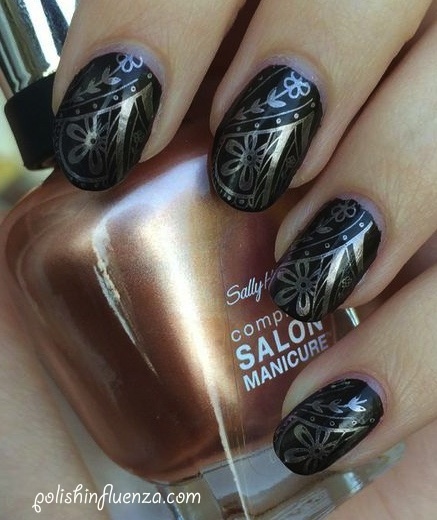 I painted the plate with Gold Roses, scraped off the excess, picked it up on the stamper, and BAM instant nail art. I’m so pleased with how the design turned out! Pictures below are without topcoat. I love this color combination. It looks vintage to me. The pattern came out so well! 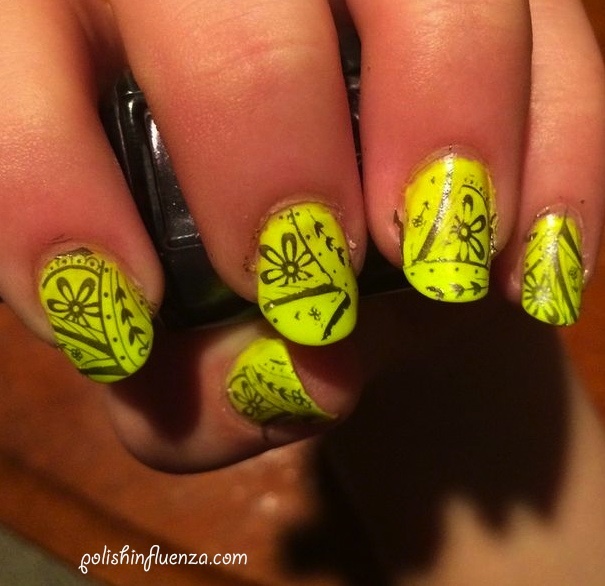 I actually did this design on one of my best friends, Tory, recently as well, with a color combo of Aeropostale Live Love Dream in Key Lime Pie and Essie’s For the Twill of it. Here’s her design! Isn’t she a great hand model, too?! Which of these color combos was your favorite? Let me know in the comments! Categories: Nail Art | Tags: Aeropostale, autumn, Complete Salon Manicure, Essie, fall, green, Konad, Live Love Dream, nail art, nail polish, purple, Rue Beauté, Sally Hansen, stamping | Permalink. The one over black for me, metal over black is always a winner. Love to see that Gold Rose stamps so well, I’ll keep my eyes open! I love that one too! I’ve also gotten a little better at stamping so I think the stamping turned out better, too. I owe Tory a new and improved stamping manicure! Amazing! I love the black and gold one. Thank you! It’s actually deep brown and gold, but either way, I love the light gold over the dark!